I've been hard at work and at long last have my first PDF sewing pattern available for sale! One year ago, I enrolled in Pattern Workshop with big dreams. I have learned so much through this process of developing a pattern. I learned how to use Adobe Illustrator and InDesign over the course of the past year. Of course there were some intense and frustrating moments, but now that I understand the basics, I actually like the Adobe programs. Designing a pattern is so very rewarding, from the beginning of the process where your design is just a concept in your mind, to the first actual product, to writing the instructions, and of course to the testing. I couldn't have asked for a better group of testers. These wonderful ladies each made a tote following my pattern rough draft and then offered their suggestions, which helped me to take the pattern and really make it the best! Have you subscribed to my newsletter yet? Keep up to date with what's going on here at Sew Happily Ever After. Subscribe today! This pattern is named after my mom, who we all lovingly call Nana. Nana adores her grandchildren and loves to spend time with them. The pattern includes a tribute page and her picture. You can read more about her battle with Lewy Body Dementia and how we all help Nana inside the pattern. With this pattern, you can make a market tote or a lunch tote. The pattern calls for insulated interfacing, but if you don't want to bother with insulation, you can substitute fusible fleece. An optional magnetic flap can be added if you are concerned about keeping your goodies concealed. Included in the pattern are pattern pieces and a cutting chart so you can use whichever you prefer. Also included are clear photographs with step-by-step instructions. Personally the lunch tote is my favorite size. It is tall enough to keep all of your lunch goodies tucked safely inside and keep them cool until you are ready to eat them. The market tote is the perfect size for carrying cold items home from the grocery story. Or for bringing home fresh veggies from your local farmer's market. This is a PDF sewing pattern. You will not receive an actual product, but you will receive a digital file with patterns and step-by-step instructions to make your own lunch or market tote. The price of this PDF pattern is $4.95. 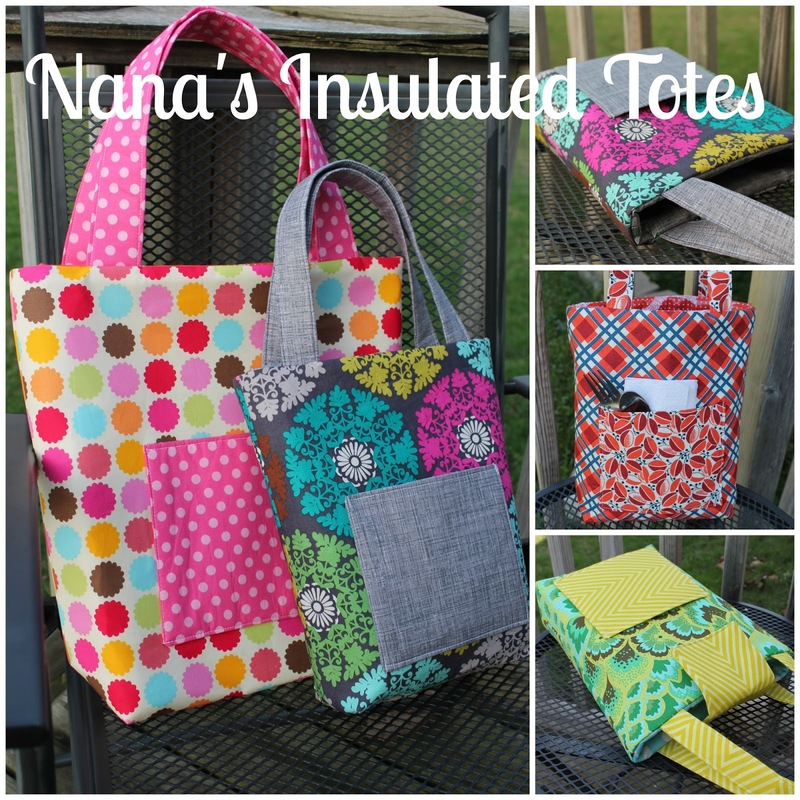 If you are ready to purchase your own copy of my brand new PDF sewing pattern Nana's Insulated Totes, please go to my Etsy shop. If you purchase from Etsy, I would appreciate if you leave a review of the pattern. You can also leave a comment on this blog post as a review if you would like. I have several free sewing tutorials and patterns, don't forget to check them out as well!